This travel themed baby sprinkle was held for my sister-in-law. When she announced that she was pregnant with her SECOND set of twins (yes, you read that right! ), our family was excited to throw her a small "sprinkle" to celebrate the new babies. She currently has 3 year old twin girls, and had a massive baby shower when they were due. This was a nice way to celebrate the new babies without going crazy. The twins-on-the-way are unknown gender (double surprise! ), so keeping the party neutral was important. She plans to decorate the new babies nursery with a travel theme, so that's what we went with an a basis for the sprinkle theme. I searched out her Pinterest board to see what she had in mind as decor for the nursery for the new babies. Everything she had pinned was a travel theme, so that was the inspiration for the party. The rainbow raindrops were picked because of the unknown gender of the new twins. There could be 2 girls, 2 boys, one of each... hardly only pink and blue. We wanted to keep all the options open for the celebration. Everything for this sprinkle was DIY. I handmade the map buntings using burlap ribbon and old paper road maps. I also made the KLANE name blocks (their last name) with wooden blocks and decoupaged maps. Since we don't know the babies names, using the family's last name worked well. I made sure that the towns that became the cut out letters had personal meaning to the Mom and Dad. It was a labor of love. I also made map garland and a rainbow raindrop sprinkle wall by running cut out paper and maps through my sewing machine. 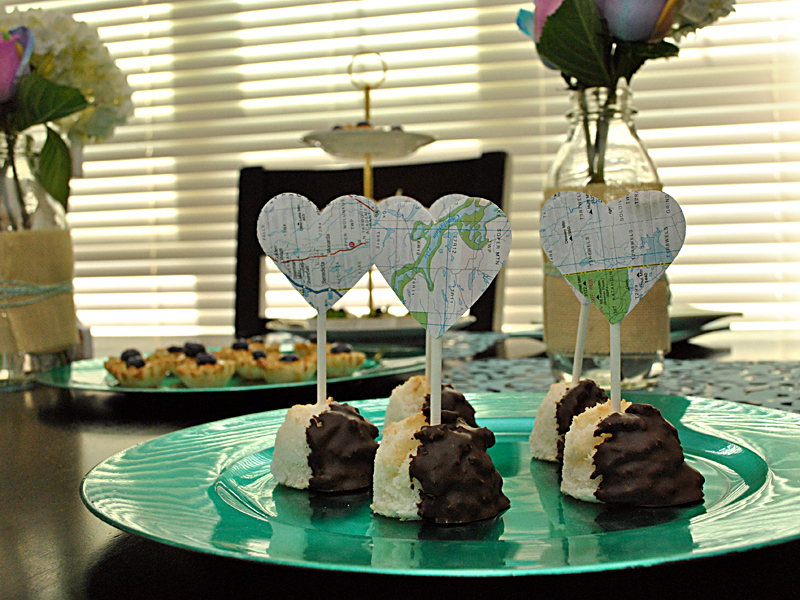 Finishing touches were maps cut out for napkin rings, dessert flags, and more. A lot of paper was involved in the decor. Desserts were set out on cake stands from The Cake Stand Lady on Etsy and all of the desserts were handmade by a family member, and they were DELICIOUS! Flowers were tie-dyed with food coloring to keep the rainbow raindrops color scheme throughout. Since we do not know the genders of the new babies, rainbows seemed appropriate. The flowers were set in re-purposed milk bottles, that I had been saving from our milk deliveries, wrapped in burlap and bakers twine. Most of the decor was made with the intention that the Mom could re-purpose it into the nursery. My favorite items are the name blocks and the cake stands. Tying the two themes (travel and rainbows) was effortless, and everything fit together so nicely, it was a pleasure to make everything for my sister-in-law! If you are planning a baby shower, or sprinkle, for someone, check out their Pinterest boards, their Project Nursery favorites, and more... using their potential nursery theme as a party theme can lead to decor becoming gifts and those gifts becoming decor!